Each summer, I daydream, I Pinterest (is that even a verb?! 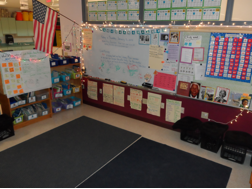 ), I imagine what I want my classroom to be like the moment my students enter it on that first day, and it always comes down to the feeling I want my students and families to have whenever they come in – I want them to feel welcome, like they are walking into a cozy, warm hug. Truly, I want my room to feel a little bit like the inside of a Starbucks, because the image of soft lights, cozy spots to curl up with a book with soft jazz music playing in the background brings me right back to calm in the middle of a busy day. And who does not need a little more calm in the middle of our busy days? Here is my attempt at calm. 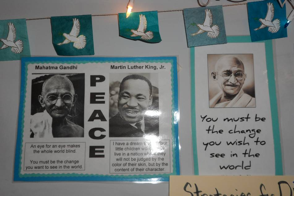 It does diverge a little from my original plans (see any of the lovely classrooms here: http://www.buzzfeed.com/peggy/30-epic-examples-of-inspirational-classroom-decor – I wish! ), but it is a realistic, student-centered, ever-evolving part of my teaching that meets the unique needs of my students, and meets the needs of me, at least most of the time. After all, it is a space we will share together for the next nine months, plus some bonus make-up snow days. 1. How do you teach? What is your teaching style? 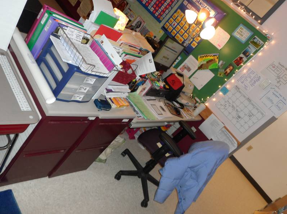 The first and best thing I ever did was to get rid of my teacher desk. Good riddance! That big behemoth did nothing but take up precious space in my classroom. Instead, my teacher area is now my computer table and a few file cabinets, plenty of space to corral my stuff, even if it does threaten to overflow at times. I teach with a workshop model most of the time, so probably the most important part of the classroom is our meeting space – two $20 5×7 college dorm rugs shoved together –fits roughly 24 small people around the perimeter. 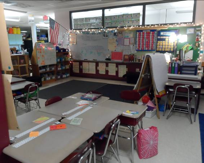 The center of our classroom is this space – it is where each day begins and ends, where I do most of my direct teaching, and there is room for everyone. I had grandiose (Pinterest again) ambitions of creating seat covers for old milk crates for my kids who need a defined seating space, but in reality, I have settled on milk crates upside down with Walmart chair cushions. Nothing fancy, keeps my wriggly kids happy ~ done and done. 2. What is the rhythm of your day? How do you want your day to flow? How will your kids work? Again, for me, this goes back to the workshop model. After the whole group mini-lesson, I need my kids to go off and work. Sometimes they go off to their desks independently. Many times they go off and work in partnerships and small groups, so I need some space in the classroom for small groups to meet. 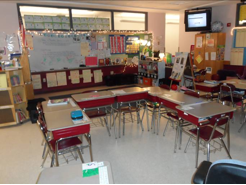 Desk arrangement is key here – kid desks are arranged in small groups, with two groups arranged in u-shapes, and I frequently cruise around this makeshift circle space in my teacher chair on wheels, it is a fantastic way to be able to reach many kids at once. I also try to have other work spaces available throughout the room ~ a cozy chair and some pillows, single and double desks tucked away here and there. Kids do have their own desks, but they regularly sit in partnerships and small groups and we also have many shared supplies, so it is a mix of community and individual spaces. The kids are allowed to work under tables if they need to. My expectation is that they can work wherever they want in the classroom but they must be focused on their work and they may not distract others. If someone becomes distracted or unfocused, I ask them to choose another spot and choose wisely. It usually works. Usually. Ta-da! The magic of Christmas lights. Overhead lights make me grumpy, and chances are if they make me grumpy, they will make my students at least a little grumpy too. There are a few overheads that stay on automatically, but I have enhanced the mood lighting with fantastically-cheap and strategically-placed lights from Target. 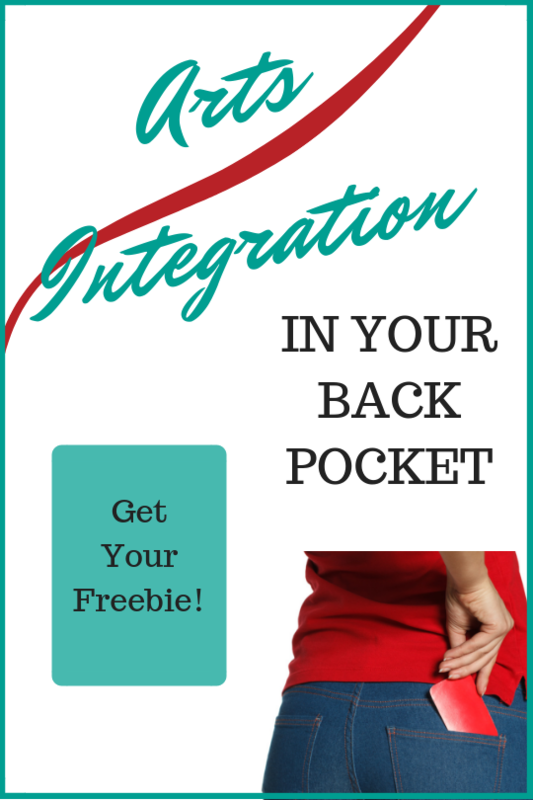 Back-to-school and Back-to-College sales coincide, and I totally take advantage of that, come August. Music inspires me, I cannot live without it. There is a soundtrack to our day – I have a morning meeting mix I made with my favorite mellow music to ease us into the day. It’s usually playing when the kids arrive in the morning and I use the last track to signal my students to finish up their task and transition back to whole group share on the carpet. Snack time brings more music, something to enhance our current unit of study (Schoolhouse Rock or Playing for Change, connected to our social justice unit of study), or sometimes something just for fun. Three songs or so and snack time’s done. Music helps define the time frame without me constantly reminding them to stop and transition to something new, it begins to happen automatically. Sometimes Yo-yo Ma plays Bach’s Cello Suites during independent reading or writer’s workshop, sometimes not. A Charlie Brown Christmas Soundtrack and George Winston’s December became the background of our wintery December days. Not quite Starbucks, but there were quiet, peaceful, focused moments that were not far from it. Music keeps us amazingly calm and focused. Lastly, words inspire me. I am a bit of a quote-junky, so again Pinterest and google hooked me up – plus a little cut and paste and my happy laminator. I see these each day and it reminds me why what I do what I do. Some are funny, some are inspiring, they all reflect who I am and what I aspire to as a teacher (be more like Gandhi, less like Grumpy Cat), and they help set the tone for life in our classroom (Don’t forget to be awesome!). 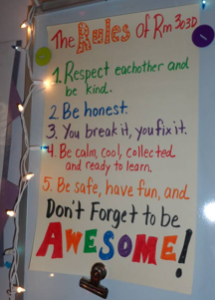 Lastly, The Rules – we created these together the first weeks of school, they inhabit a special spot at the front of the room, and we chant them every day. This is who we are and who we want to be as a class, this is what we need to do to get there and how we need to treat each other so we can all help each other succeed ~ a tall order, but the backbone of our classroom community. All these things make our classroom feel a little more like home away from home, which is just how I like it. 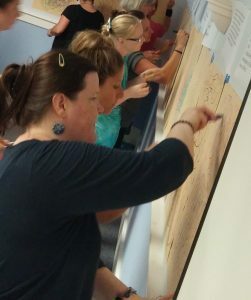 Julie O’Neill is a third grade teacher at the Cashman Elementary School in Amesbury, MA.